The ITACET Foundation was delighted to receive recent news from one of its scholarship students for the current academic year 2017-2018. John Paul Ramirez Santa from Colombia was awarded a scholarship by the Foundation to follow the MSc in Tunnelling and Underground Space at Warwick University in the United Kingdom. Alfredo Vasquez received a scholarship from the ITACET Foundation to follow the 2016-2017 edition of the Specialized Master's in Tunnelling and Underground Sructures, run by the ENTPE / INSA in Lyon France. Following his successful graduation, he talks about how the Foundation helped him start his career. "Tunnelling has been a part of our lives for more than 100 years. We have long come to realize that the surface will one day become congested and that the best way to connect two points beneath the ground is by a tunnel. It is my great pleasure to announce that the ITACET Foundation and the IRF are joining their expertise to build a comprehensive programme of training sessions on tunnelling with the help of the ITA-CET Committee. The aim is to run the programme for three years, starting January 2018, and to offer a set of training sessions on specific topics such as tunnel design, construction of tunnels, tunnel operation and tunnel maintenance. Social networks are becoming an increasingly important media used by organisations to communicate on their activities. With this in mind, the ITACET Foundation has recently increased its activity on its Linkedin page, with regular posts on forthcoming training sessions and events that have taken place. The mid October issue of the on-line magazine “TunnelTalk” included a special focus on education and training in the tunnelling industry. As part of this focus, an article was specifically dedicated to the work of the ITACET Foundation and ITA-CET Committee. 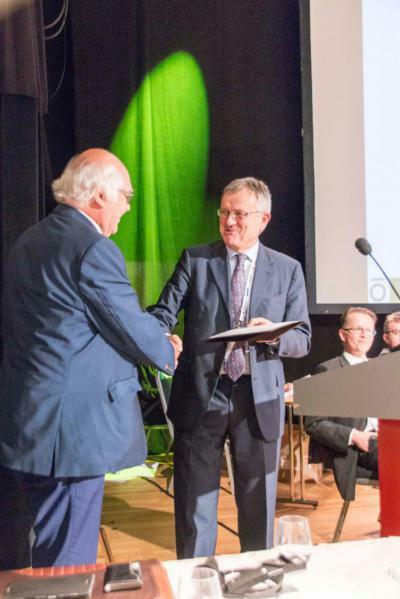 This year's ITACET Foundation award was presented to one of the most influential figures in modern tunnelling, Dr Martin Herrenknecht of Herrenknecht AG. The award was presented during the ITA General Assembly in Bergen, Norway, in the presence of the 52 Member Nations that participated. The ITACET Foundation is pleased to present the latest issue of its newsletter, which as you can see has a brand new design.